The standardized platform introduced by Volkswagen on the new Golf 7 made headlines at the Paris auto show last September. The company is leveraging economies of scale like never before, using a new modular production system touted in automotive publications for providing flexibility in production regarding quantity, degree of automation and vehicle type. 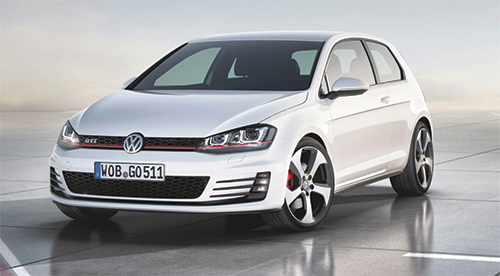 European automotive publications have heaped praise on Volkswagen for the standardized platform it introduced for the new Golf 7, debuted at the Paris auto show last September. The company is leveraging economies of scale like never before, using a new modular production system touted for providing flexibility in production regarding quantity, degree of automation and vehicle type. A key enabler of VW’s new production system is highly dynamic press-automation technology designed to increase throughput by 20 to 30 percent over previous technology, depending on the specific sets of dies in use. In addition, the new automation (large-scale crossbar-transfer systems from Strothmann, along with front- and back-end robotic blank- and parts-handling equipment) has reduced energy consumption by as much as 35 percent. The transfer systems can transport as many as four stampings in one step, compared to two previously. …is Strothmann’s CompactTransfer system, a four-axis system (with height and cross-section compensation) based on linear technology. The CompactTransfer system makes orientation stations between presses unnecessary since it picks up the parts, orients them and places them in the following press all by itself. It can maneuver workpieces as large as 2500 by 4600 mm, with weight capacity to 120 kg (combined blank and tooling weight); typical press-to-press distance is 5000 mm. The system’s compact design enabled it to easily fit into the small available mounting space between existing press bolsters and rams at the VW plants. Four linear axes and one rotating axis, each with its dedicated drive, enable the CompactTransfer system to execute extremely agile orientation functions. For maximum freedom of movement, the crossbar is suspended on two pivot joints. It integrates a telescope piece which allows for dynamic length compensation. The CompactTransfer halves can thereby—within limit—travel in different directions. Thanks to the new transfer-automation technology, Volkswagen was able to increase line speed from 14 strokes/min. to 16 strokes/min. And, for the first time, the retrofitted press line allows for the separation of double blanks during transfer and for the transfer of as many as four parts from one die to the next. Further, the die-change process has been automated, resulting in additional, significant time savings. A key enabler of VW’s new production system is highly dynamic press-automation technology, including Strothmann CompactTransfer crossbar systems designed to increase throughput by 20 to 30 percent over previous technology. Before the retrofit, the VW pressroom’s handling equipment was coupled with the press mechanical driveshaft. Now, the transfer system and press have been decoupled, and mechanical wear has been minimized as a result. Stripping the 59,000-kN press, 600 tons of steel and copper were removed and assigned for internal recycling. Only the press bolsters, drives and foundations were left alone. In the retrofitted press line, the press rams attach to the shaft with a 30-deg. offset from each ram to the next. The CompactTransfer system is synchronized with the movements of the press rams in real time. It can thus work with a minimum amount of maneuvering space, and optimizing stroke rate. One of the specifications for the VW modernization project was systematic standardization, to facilitate maintenance and troubleshooting. Presses from various manufacturers and the respective diverse control systems were to be visualized on a uniform surface. Accordingly, the higher-level control system and the safety controller were to be designed consistently and transparently. The comprehensive transfer-automation concept combines a blank feeder with a fully automatic tool-change system, the CompactTransfer system, and standard robots at the end of the press line. Programming the motion curves, Strothmann used Siemens press-simulation software to determine the most efficient and safe paths. The theoretical maximum acceleration is 25 m/sec.² for the horizontal axis and 15 m/sec.² for the vertical axis. In operation, the system accelerates by 20 m/sec.² (horizontal axis) and 10 m/sec.² (vertical axis). Retrofitting the CompactTransfer system proved to be a simple and fast process for VW. It was able to exchange a complete module within a few hours by using the existing drill pattern on the press frames. In keeping with the drive for standardization and uncomplicated maintenance, only standard parts were used for the linear-motion bearings and drives. And, as specified by the customer, Strothmann installed Siemens drives for the particularly highly demanding tasks. In comparison with articulated-arm systems, the solution therefore offers a range of advantages: the linear technology used for carrying out the complex and long transfer paths is simpler and more transparent for the operator; orientation stations are not required; and the drives are positioned where they cannot be destroyed by the dies. Setup time also has been significantly reduced through automation. Strothmann fitted the die-change tables with front holding frames. Now, whenever the press line needs to be set up for different parts, the Compact-Transfer can simply place the crossbar in the bracket so that it is removed from the press line along with the dies. The operator can then loosen the quick-release skewers on the crossbar and exchange the tooling. The blanks are carted in front of the press line on Strothmann RoundTracks—a floor-rail system designed for transporting heavy goods. The rails are recessed to sit nearly flush with the floor, and, due to their reportedly extremely low rolling resistance (0.01 friction coefficient), RoundTrack systems require relatively little energy. Two feeders (Strothmann SRLM-2/120 models) unload the blank trolleys at a combined 18 strokes/min. The trolleys feature lifting apparatus to mechanically adjust the stack height. Double blanks are automatically detected and discarded, and then the sheets are washed and lubricated. An indexed conveyor then transports blanks to the press as a set of four line cameras monitors their positions. A vision system analyzes the data and, based on the results, directs two centering robots to correct blank position. Article provided by Strothmann, with U.S. sales based in Marietta, GA: 770/424-4141; www.strothmann.com.